That is certainly seems to be what I’ve done this week. I needed to do it and I do hope that it wasn’t too boring to any of you. I was seriously off of several tracks and needed to focus in. Those of you reading for a while know that focus is often one of my issues, but I feel I’ve succeeded this week and I’ve learned one important thing about myself. On Thursday night, I finished off the impromptu soup I made the other day. 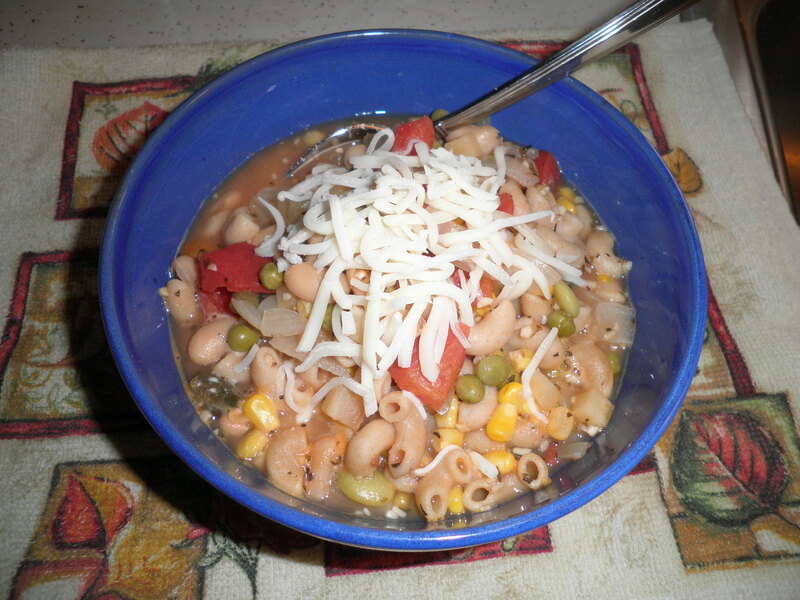 As with most soups, it tasted better the second day. Topped with some shredded mozzarella and provolone. This is where the thing I’ve realized about myself comes in. Cheese. I can’t control cheese, I can’t keep it around. Sliced or shredded…if it’s in the fridge…it’s in my mouth. It’s sad, but I have to do something about my lack of control. My plan is this. I won’t buy any shredded cheese and will try not to buy too much sliced cheese. I can’t keep that out completely because Ralph likes it for sandwiches. I just have to make myself a rule that I will not eat it. It worked with chips. As of October 9, it will 19 months since I’ve had chips. It has helped. My plan is that I will allow myself the grated Locatelli cheese, I can use that in stir fries and salad. I will also allow myself cottage cheese. Not technically a cheese, but it works well to give stir fries some “cheesiness.” I’ll try not to be boring about this, but I will keep myself in line by talking about it here. Wish me Luck! 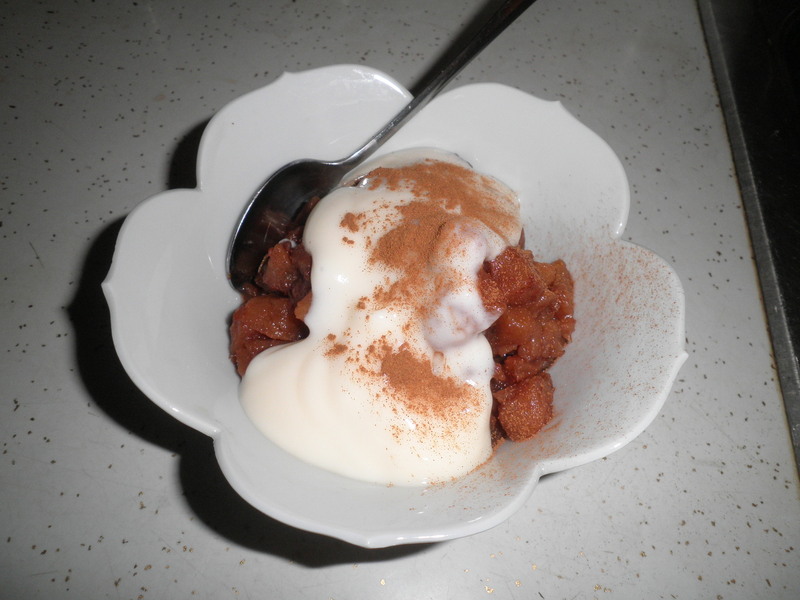 My wonderful crock pot apples topped with fat-free vanilla yogurt and a bit of cinnamon. Excellent snack! 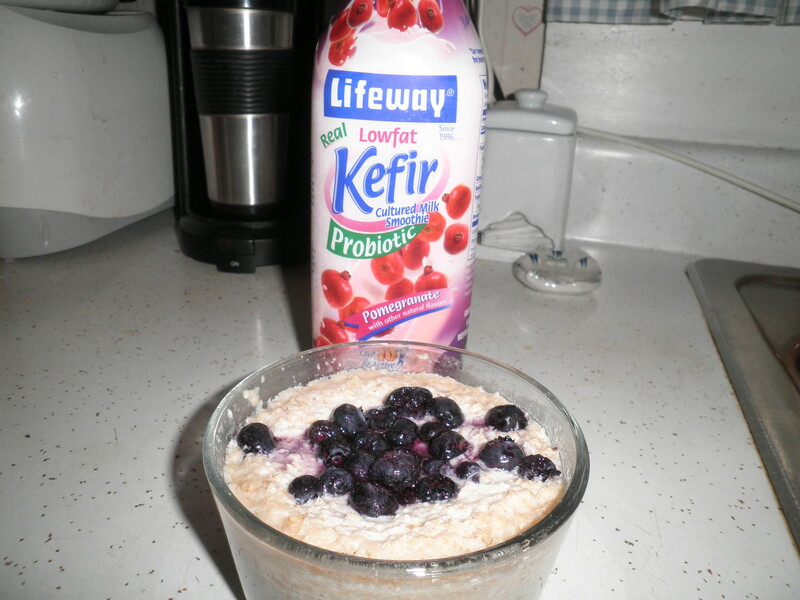 Friday breakfast was overnight oats made with 1/2 cup of oats, 1/2 cup of almond milk and 1/2 cup of this pomegranate Lifeway Kefir. Topped with frozen blueberries before 1 minute and 30 seconds in the microwave. The Kefir is tangy and fruity and I love it in this. 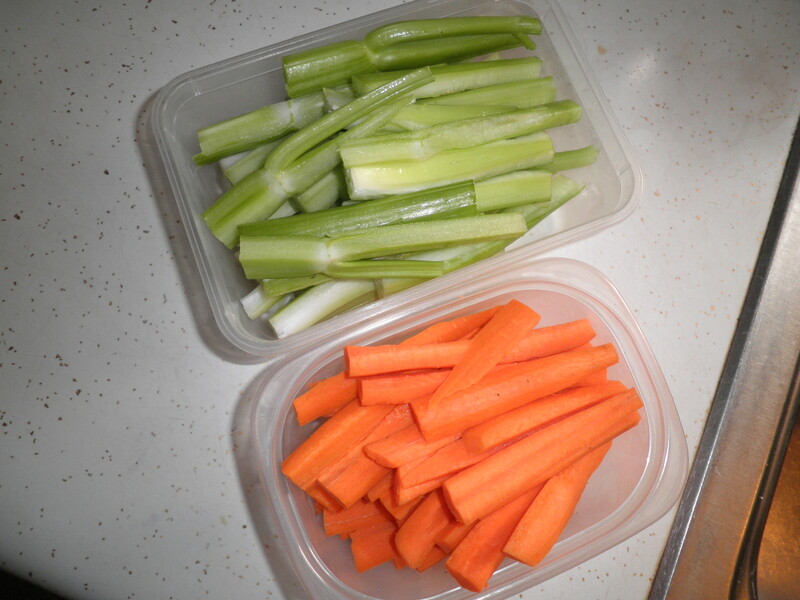 Carrots and celery chopped and ready will help me stay on track. 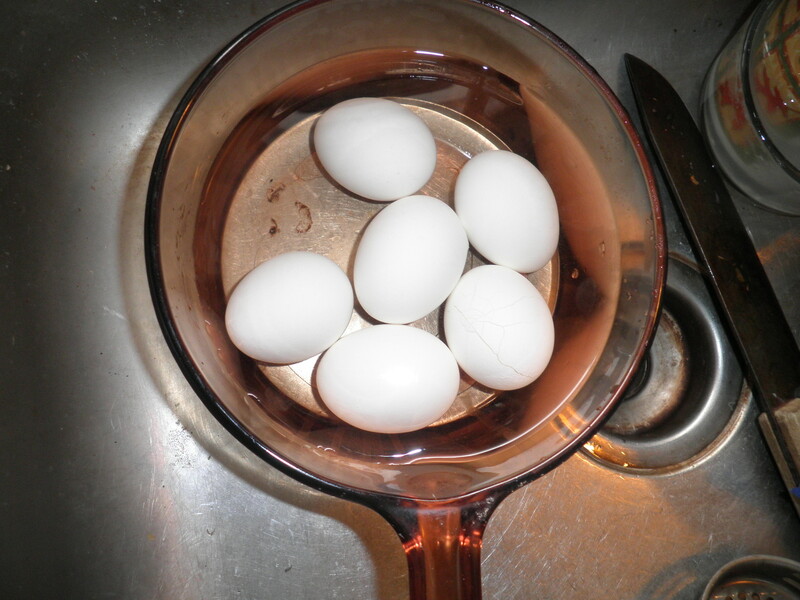 Boiled up some eggs for lunches and snacks. 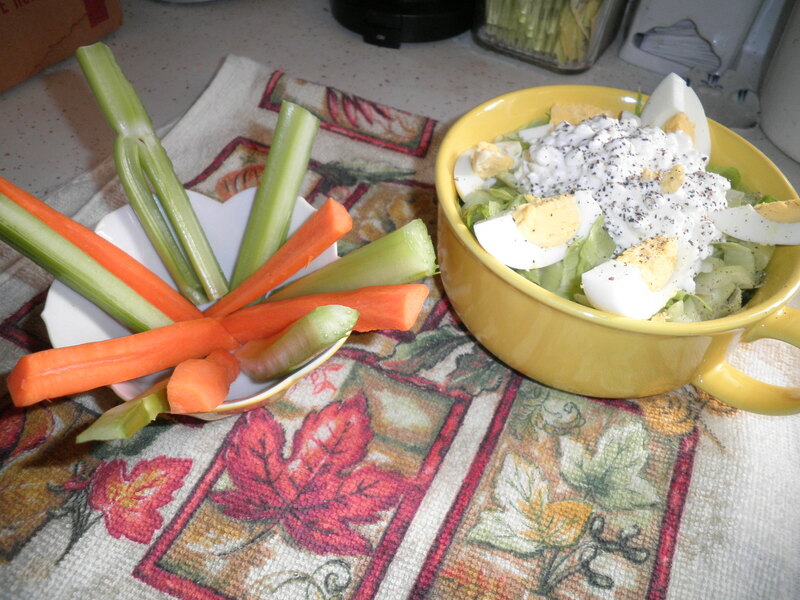 Friday’s lunch…chopped Romaine with cottage cheese and hard-cooked egg with Lots of ground black pepper. A side of carrots and celery. Forgot I had this little bowl that matches my Big bowl! This entry was posted in Uncategorized and tagged exercise, focus, Weight Watchers. Bookmark the permalink. glad you are feeling so positive, fran, and had such a good week! best wishes at ww – hope you get the outcome you are hoping for! can you believe it is just recently that i had provolone cheese for the first time…i really like it! good for you for being off the chips so long…there are some things we just have to firmly say NO to (for me that is diet coke, as you know!). love how you arranged the carrots and celery in that last photo! Thanks, Cathy! You are always so supportive and I appreciate that! Provoline is good, nice and mild. Funny how we never get around to trying something. Not that I don’t miss chips, but I just know they’re not a good choice for me. Proud of you for your No Diet Coke campaign! The carrots and celery are such a good trick…IF I remember to cut them up! Have a great Saturday! Oh cheese is so hard to resist, I hear you! I have the same issue. Also with nuts! Maybe there is a cheese that Ralph likes that you are less fond of? That might be less tempting! Amazing about the chips-go you! Good luck re the cheese and have a great weekend! Thanks, Stacie… for me it’s pretty much any cheese and I can’t deprive him, it’s not his issue. I’m the same way with nuts…Try not to buy them for that reason. Have a great weekend! That soup looks great! I have a weakness for cheese, too. Unfortunately, with kids in the house, I have to keep buying it. My challenge is not to eat so much of it. Hi Dana! It’s a very hard thing for me to control. I’m learning that things that I can’t control, I just can’t have. I’ve done it with peanut butter too. Regular peanut butter will end up on a spoon, then in my mouth, no need for bread or crackers. Almond butter or sunflower butter doesn’t give me the same problem. So crazy! The soup WAS delicious! Oh my gosh, Fran, that soup looks delicious! Liz…So good and SO easy! !